Film showing and talk hosted by Amnesty International and Rahma Relief Foundation. This documentary tells the story of Ghiyath Matar and the peaceful uprising of the city of Daraya in the suburbs of Damascus in 2011. Daraya was the centre for peaceful protests in Damascus in 2011. It had a history of civic activism going back a decade; in 2003 civil society activists organised street cleaning exercises and public health and anti-corruption campaigns, and even organised demonstrations against the Iraq War, culminating in a silent demonstration to mark the fall of Baghdad to the American invasion. For these activities many activists were arrested and endured 2-3 years in prison. The film documents, through interviews with activists inside Syria, and those forced into exile the story of Daraya’s uprising, and Ghiyath Matar’s role in it. 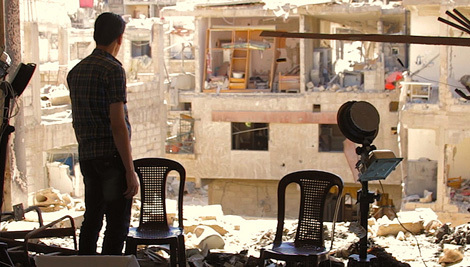 Although at the centre of the film, Ghiyath is never pictured; instead his comrades recount the beginning of the uprising, and how Ghiyath’s ideas of peaceful resistance to the Baathist tyranny were taken up and acted upon in Daraya. The film is full of poignant moments as the exiled revolutionaries recount the days of the early protests, their first taste of freedom as they began to shout anti-government slogans for the first time and broke the barrier of fear that had been built around their minds. Footage of the early protests is shown, and the activists explained how they wanted to keep the revolt peaceful as the best means to threaten the regime. This peaceful resistance was what the regime feared most, and Ghiyath was its champion. His friends recounted his fervent belief that the soldiers would not kill them as they were their fellow Syrians, and that their best hope was to appeal to them as Syrian brothers and fellow human beings. Ghiyath was a key organiser of the tactic of holding roses on demonstrations, and of giving bottles of water to the police and soldier who come to repress the demonstrations. In the middle of summer 2011, many of the soldiers were thirsty and dehydrated and gladly accepted the water, although their commanders did their best to dissuade them from taking it by saying it was poisoned. Usually the demonstrators would have to leave the bottles of water stood in the street for the soldiers to collect as they moved towards the protests. Activists would write notes and attach a rose to the bottle, sending messages of love and peace to them. On one occasion their protest accidentally marched into the ranks of the soldiers, and they were able to give the water bottles and flowers directly to them, infuriating their officers. When the regime attempted to intimidate families from holding public funerals for murdered protestors, funerals which would inevitably themselves become protests, Ghiyath organised his activists to mobilise the local population so that tens of thousands of people marched to the homes of the victims to defy the regime’s intimidation. Some of the most fascinating parts of the documentary are those filmed in besieged Daraya itself. Director Sam Kadi, speaking after the showing, outlined how they had recruited and trained a cameraman to film the scenes within the besieged area, and then arranged to have the film smuggled out to the US. They had to smuggle the footage out of Daraya on thumb drives taped to the body of an activist who was escaping the siege. The thumb drives were smuggled to Damascus, then to Turkey then to LA where it was edited. Motaz Morad and Muhammad Shihadeh, two of the original activists who worked with Ghiyath Daraya, and who remained behind in the siege, were interviewed in talking about how the ideas of Martin Luther King and the US civil rights movement influenced their work. As they talked, sniper fire could be heard in the background, interrupting their interview, a reminder of the regime’s constant attempts to wipe them out. When the film footage reached the US, they found out the audio had been ruined by a strange humming noise. They thought it was broadcast by the regime on purpose to ruin any recording done within Daraya. In the end an editing studio agreed to do the cleaning up work for free when it learned what the content of the film was. “Daraya, what is special about Daraya? It’s the activists, the youth, they are very special, very humble and very dedicated to making a change in their country. The regime’s response to Ghiyath and his comrades peaceful resistance was brutal. Peaceful activists were arrested and beaten and tortured, often to death. Activists took to living in outlying farms surrounding Daraya to escape the constant raids on the city by the security forces, only returning to organise and participate in protests. Eventually Ghiyath and another leading activists Yahya Shurbaji were lured back into the city and captured in a trap. Several days later, Ghiyath’s horrifically tortured body was returned to his family. Yahya’s whereabouts are unknown, he has not been released nor had his body returned. Najlaa Al-Sheikh, one of the women activists interviewed spoke about the anger felt by other peaceful activists when news of Ghiyath’s murder reached them. Although completely opposed to using violent means to overthrow the regime, the torture and murder of Ghiyath made them consider taking up arms against it, and drove many to support those groups already doing so. When asked about the prospects for the future of Syria, Najlaa replied in a poetic fashion typical of many of the activists; “"We have sowed freedom and it will be reaped by our sons"
None of the activists believed the conflict would end soon, but they all felt that freedom would come to Syria, in time. A poignant moment was brought to the discussion at the end, when a young Indian activist stood and talked about how the film had affected him. He mentioned how inspired he was by Ghiyath’s example, and that Ghiyath should not be known as ‘little Gandhi’, as that prevented linking his name with his actions, which deserved to be known in their own right. Instead he said, everyone should know Ghiyath Matar’s name so that he would have his own legacy and people would remember Ghiyath, not as a ‘little Gandhi’ but as an inspiring example of the Syrian revolution’s peaceful glory days, when everything seemed possible. See all posts on Daraya. God Bless you. We are trying here in America to help you now, today, tomorrow, until you are all safe.God Bless you all.